This Find a Job section will help you understand the strategies you need to find the right job. It will describe each strategy. It will help you organize your job search so that you can be successful. 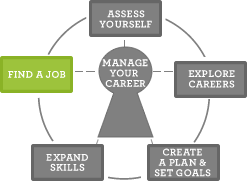 Here’s where you'll apply what you learned in your assessments and career exploration. Looking for a good job can take awhile. Make sure your finances are in order. Create a Personal Budget. Job search can be stressful. Take good care of yourself during this time. Have you thought of some health rewards for yourself? Use the Job Search Checklist (pdf) to make sure you covered all of your bases.